Thanks for that Dave, never thought of that at the time! Just had a look at your link, and yes very useful looking. Ironically, I might get one anyway as both our crossbars are odd ‘ isosceles trapezoid’ shaped cross-sections and not ideal for fixing. Look it up Dave! I might have spelt it wrong! Agree that the low step through can be a challenge to stow securely on the Fiamma carrier without some movement when travelling. Recently resolved by buying (for one of the bikes) the Halfords 'Cycle Carrier Suspension Cycle Adaptor' (false adjustable crossbar) was half price at just £10. Of course there is the Fiamma version that is more expensive. That's a handy gadget Dave! I've bookmarked that page and I'll check to see if I need one when the bike arrives. Not a problem I’d thought of as we have one of these. I can thoroughly recommend them for anyone interested in electric bikes who is concerned about hoiking them up onto the Fiamma height bike rack. Maasai Warrior wrote: Thanks for that Dave, never thought of that at the time! Cheeky git, I don't need to!! You did spell it correctly, but I suspect your terminology is inaccurate. 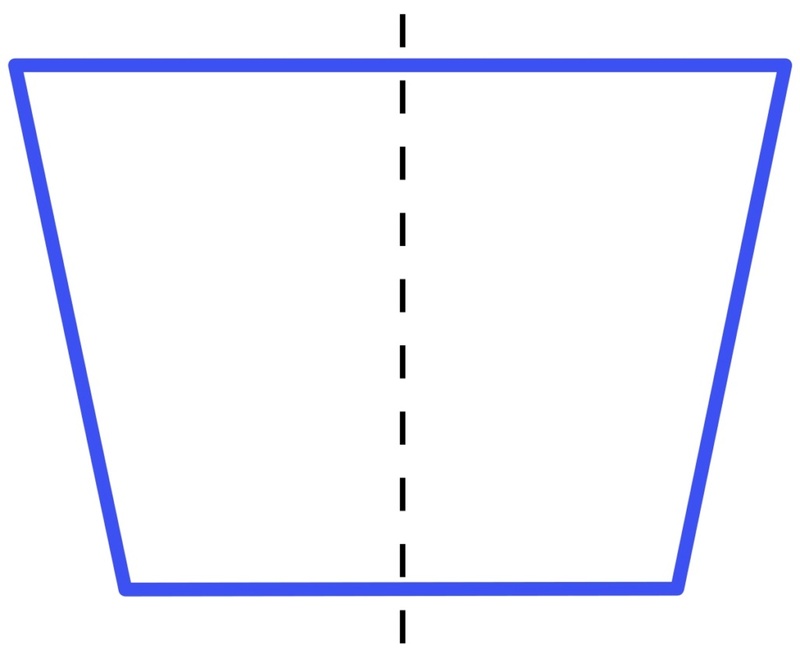 The actual term used is "isosceles trapezium", and it's a special and uniquely shaped trapezium. Your bikes might have such frames, but I doubt it. Do they really have two symmetrical halves . . . mirror images about a centre line? I would guess they are more likely to be somewhat squashed trapezia. P.S. Don't you just hate smart arses!! Gromit wrote: Cheeky git, I don't need to!! Dave, I was using the American version - ‘trapezoid’ to see if you would take the bait! - and guess what you did! The diagram below shows the cross sectional shape of our crossbars, on my Boardman bike and Caroline’s Scott Ebike. Not easy to grab on a carrier! "isosceles trapezium" in the UK! P.S. I wouldn’t like to play you at Scrabble! It never occurred to me that you would to stoop to using ghastly Americanisms! Electric bikes don't necessarily have to weigh a lot. My Gary Fisher bike is pretty light at about 14kilos, but I know a fellow motorhomer whose road bike is 7kilos and his wife's electric bike is allegedly 12kilos. I think that both bikes are in the £4-5,000 range. Yikes. Don't know if anyone watched Britain by Bike last night on C5 with Larry Lamb and his son George. Larry uses an electric bike and seeing it reminded me of a question I've long wanted to ask. Why do electric bikes have such high handlebars? I thoroughly enjoyed their last series and recommend it. 8pm on Friday. At a guess I’d say as most are designed for the Dutch and German market where they are much more numerous than here, and their ‘regular bikes are all of the sit up and beg variety. The MTB models now look much more like normal mountain bikes. In Leisure Lakes near here most have the lower handlebars, with prices that make me think they must be designed by Ferrari. Being short I took awhile to find an ebike to fit, and this time, settled on a Raleigh Motus with 26’ wheels. The smaller wheels made a huge difference. I adjust the handlebars to move them nearer and also move the saddle forward so I can reach with ease. One facet of any bike which is often ignored, is the seat, get that right and cycling is a pleasure. Generally I have changed seats on most of our bikes, especially for my wife. My presant standard one is fine. When selling them on, the original is replaced and the comfortable one kept. Bad Penny wrote: One facet of any bike which is often ignored, is the seat, get that right and cycling is a pleasure. Grommet, sorry Gromit, looks like my computer is not the only one cannot spell! Not the computers fault but mine Richard, I hit the wrong button. I spotted it as I sent it. For anyone who missed it. Present with an a not an e, I have slapped my wrists. I wish I could do that..! Excellent point Leighton. My current, fairly broad, saddle has a slip-on padded foam cover and is fine for the first mile or so but, over the course of a day, becomes really uncomfortable. Trying before buying a replacement is impossible as you can't really take one home and give it a proper trial and, once used, it can't be taken back. A few minutes in a shop doesn't help. There are seats more suitable for women than men Quilter, I think one is called a sofa seat. It is trial and error I'm afraid. If you have a reputable dealership near you, speak to them for advice, preferably a small one rather than a chain. We have a number of seats in bags here, having discarded them over the years. One seat cost just £8 and was so comfortable to use. You say your padded shorts are no use, are they cheapies from one of the German supermarkets? If so, invest in a good quality professional pair. They will not be cheap. Another thing to remember about cycling is, if not done regularly the base of the spine will hurt for a while, particularly if only done when on holidays. Apart from all the little problems, cycling is still a great way to excercise and enjoy. Been there (both of us) so I know what you mean. We went for Brooks saddles years ago, against all apparent logic as they are as hard as nails. Never looked back though! Lots of leather oil (and I mean lots) on both sides every couple of days for a fortnight, then wipe it clean and start using the saddle. It really does go "bum shaped" after quite a short time, and becomes far more comfortable than soft saddles - particularly at the end of a long ride. We have the men's and women's versions of the B67. Not cheap by any means, and a bit of a risk as you won't know how good it is (or not) for several weeks after buying it. Quilter, just checked the seat on my wife's bike, unfortunately there is no name on it. It is well padded but soft and wide at the rear with a groove in the centre then tapered to the front. Mine is of similar style, but not so soft. Many thanks both. I think I had a Brooks saddle on my first bike, aged 11, a Raleigh, and don't ever remember any problems with it and I was less padded then and cycled daily to school. I've seen them since but hesitated as I expected them to be hard and uncomfortable but I will go and have a closer look. Yes, my padded pants are Aldi bought. I didn't want to go the whole hog and buy cycling shorts as I would look a right pillock and these are the only cycling underwear rather than outerwear I have found. I will have another look in some of the many bike shops we have in Oxford. A few years ago we had our old push bikes stolen in La Linea and, when the Spanish police got them back, we took them to very good bike shop in Conil as the saddle of one was missing and the gears had been cut. The delightful bike mechanic- for a joke we think- replaced the saddle with one of those used by pro cyclists who do the Tour etc. My OH had it changed pdq but not before we'd tried it. I can't understand how anyone can do even a kilometre balanced on what seems like a knife edge. Some cycle shorts or cycle underwear can be worn under shorts. Have a look on the internet, for the different types. I'm sure you will sort out a solution. My wife sometimes put cycle shorts on underneath a cut off pair of trousers. Still use my Brooks saddle, bought 40+ years ago. Fully concur with Gromit's post above. Bad Penny wrote: Not the computers fault but mine Richard, I hit the wrong button. I spotted it as I sent it. For anyone who missed it. Present with an a not an e, I have slapped my wrists. No problem, just glad I am not the only one who hits the wrong button. I usually get put right by some on here, not aimed at you by the way. No problem Richard, I notice many people hit the wrong button, especially when close to the correct one. If like me, I sometimes post in a hurry, send without a check and find later, Iv'e made a mistake. I have to do an awful lot of correcting as I seem to be dyslexic on the keyboard. Transposing a pair of letters in a word is my favourite trick, and I don't always notice the spelling mitsake until it's too late.